I love spaghetti squash – no matter how you cook it: in the oven or in the crock, it’s one of my favorite vegetables. I like to buy several at the Farmer’s Market when they’re in season and keep them in my basement where it’s cool. I can keep them for 2-3 months this way. But I’ve had people tell me you can also store them in the fridge for extended amounts of time…but my fridge is usually crammed full with various things in mason jars. 1986 was my last year as an only child – my sister was born in 1987, when I was 5 years old. Interesting fact – she used to beat me up. My parents told me it would happen…just like I’m telling Annie the same thing about her younger brother. My parents were right, so I’m probably right. Jamey doesn’t beat me up any more – we’re friends now. Cool, huh? 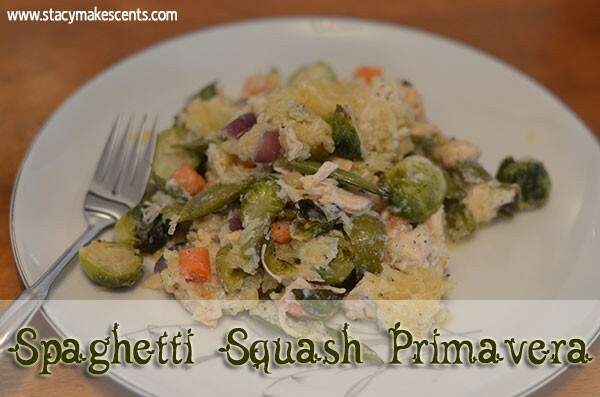 I chose Almost Pasta Primavera for this week…which I renamed to Spaghetti Squash Primavera – I like titles that tell me stuff or get my attention, like Cajun Chicken Pasta or Buffalo Crack Slaw. ALMOST Pasta Primavera? What does that even mean? 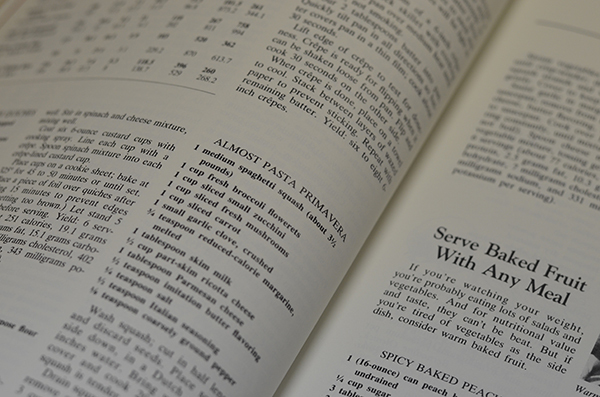 This is almost cooked…this is almost ready…this is almost, but not quite Pasta Primavera. Lame name. So, I changed it…the name and the ingredients. I didn’t want to use low cal margarine. Yuck. I actually just nixed that ingredient. Because really…it called for ¾ teaspoon low calorie margarine. Why even bother? Who even uses ¾ teaspoon butter for a whole recipe? I’ll tell you – a quack, that’s who. I changed a lot of the stuff in this recipe – so it doesn’t resemble this one much at all. 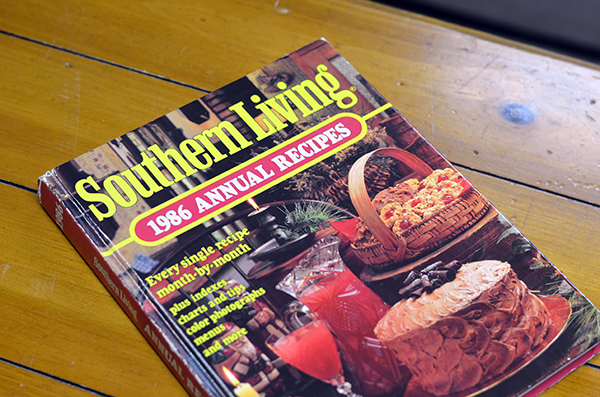 That being said, thanks for the idea, Southern Living! This recipe didn’t call for any meat. But, I like meat. We’re good friends. I added 1 cup chopped, cooked chicken. 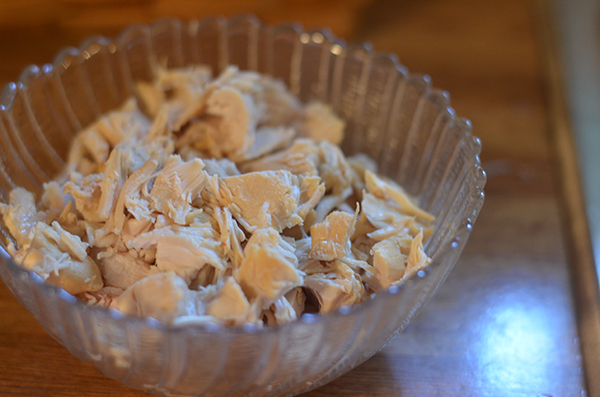 I always try to make sure there is cooked chicken in the freezer – I make Crock Pot Baked Chicken a lot so I can always have cooked chicken on hand. You should too…come on, everyone’s doing it. 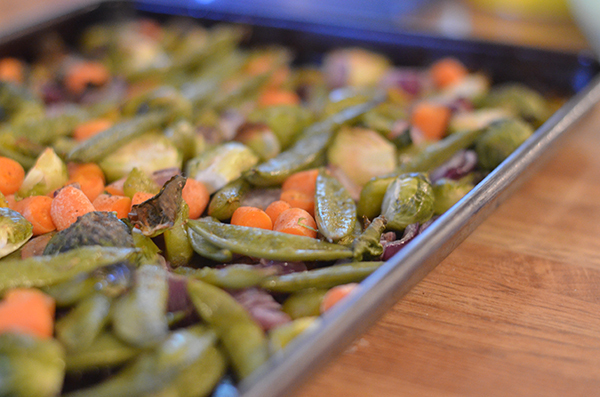 For this recipe you can steam or roast your veggies. Roasting is my method of choice for cooking veggies. 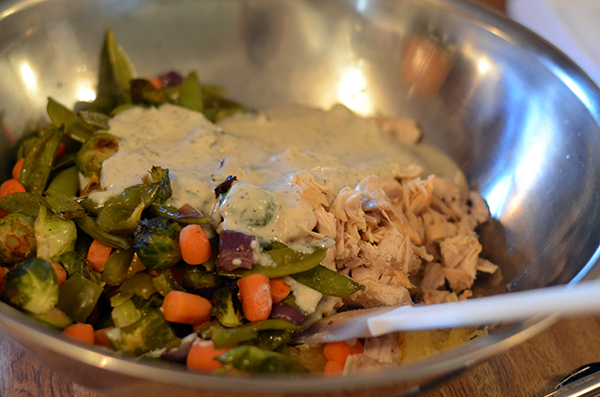 Any veggies will do – whatever you have on hand. Just make sure it’s 4 cups worth. I used: snow peas, carrots, brussels sprouts, onions, and green peppers. It was delicious! I would have used zucchini, but I used all of them in Zoodles. Oops. Make sure to season your veggies well. I used Seasoned Salt, because it’s what I use on almost everything. I’m a creature of habit. You’re going to make a sauce, kinda like alfredo, in a small saucepan. It comes together really fast – like in less than 5 minutes. Don’t boil it unless you enjoy scraping burned dairy products off of pans. I don’t…but I somehow end up doing it regularly. Set a timer, for Pete’s sake! When everything is ready, just mix it all together in a big bowl and then spoon it out on to plates. Or, if you’re home alone, you can stand at the kitchen cabinet and eat it straight out of the bowl. Put a movie on so your 4 year old will be occupied and won’t tell Daddy as soon as he gets home…someone around here has loose lips. GUESS WHAT MOMMY DID!?! But really, this is just another fabulous way to eat spaghetti squash. And if you haven’t jumped on the spaghetti squash train yet, you better hurry. It’s leaving the station. All aboard! Roast or steam veggies and prepare squash. Warm chicken. In a small saucepan, combine ricotta, milk, Parmesan, Italian seasoning, salt, pepper, and garlic powder. Cook only until warm and combined. In a large bowl, toss together spaghetti squash strands, veggies, chicken, and sauce. 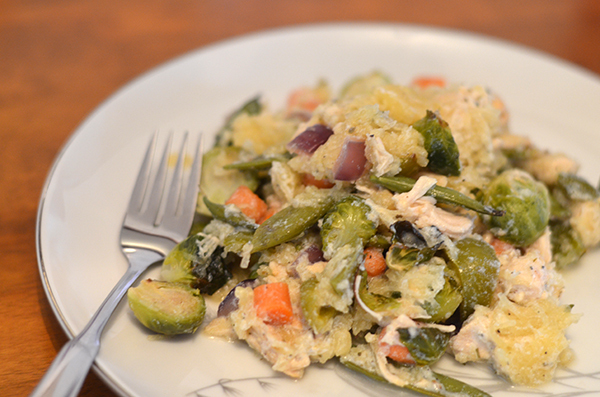 This looks really good… love squash and brussel sprouts!! Yum! Top 15!! This recipe sounds wonderful. Thanks for showing it on Strut Your Stuff. Hi! Stacy, I am visiting from Freedom Fridays. This looks delicious! I love spaghetti squash. I just learned how to BBQ or grill it. It is wonderful. Come by and see me sometime at Soup Spice Everything Nice. Pinning this recipe now! How a lovely day! Oh my gosh! Grill it?! Mind blowing!!! Love all these yummy recipes! I love fudge! I will have to try this one & see if the troops give it a thumbs up! I hope they don’t – because then YOU can eat it all. Hey, Stacy, ended up following you on another bloghop. Can’t wait to try this! Hooray! 🙂 Thanks for stopping by! Your posts always make me laugh! What an easy and delicious recipe. I’m glad you like the almond joy fudge and feel almost famous that my recipe was highlighted on your blog (and that your mama liked it too)! We ate the last of the batch yesterday. I considered holding a funeral. Must. Make. More. Thanks for the link up Stacy. Your spaghetti squash primaries sounds wonderful. 🙂 It tastes wonderful too…tooting my own horn here. Thanks for sharing, Stacy! I am excited about this one- I have just recently begun using Laughing Cow as a sauce (as in Creamless Creamy Veggies) but wouldn’t have thought of ricotta! And we are always looking for new things to put over spaghetti squash!! Thanks for encouraging me to link up for TH Tuesday- I am sobeautifuladay on instagram and post food there all the time, but today is my first time joining the link party. Whoop! We love laughing cow around here! 🙂 And serious cows too – they make good hamburgers. You’re hilarious. And this sounds so yummy! I’m going to try to make it dairy-free with one of my famous but not really coconut milk-cream sauces. Yup, I’m going to do it!! Great recipe! And keep cooking through that stash, girl!!! I’m so glad that Food City keeps them all the time!